Every year on this date, a sudden murmur outside catches my ear. It quickly rises to a gabble, rather like the parrots who squawk hysterically when they fly overhead. It’s the kids in their Halloween costumes! 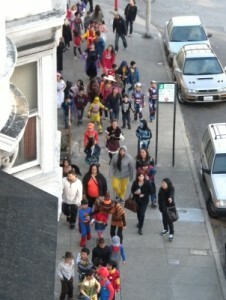 They walk up the Greenwich Street hill from Stockton to Coit Tower. When they reach the bottom again, they’ll make a ceremonious circle around Washington Square Park. Like the Columbus Day Parade, this event has endeared itself to me for its hokey straightforwardness — “We are wonderful and we want to show you!” — plus its diversity. 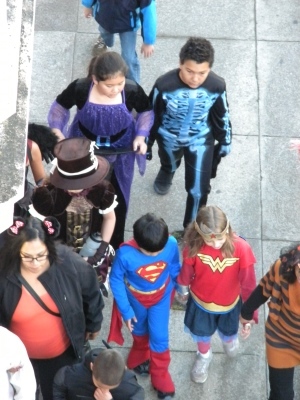 A Latino Spiderman, a Caucasian Wonder Woman, a Chinese tiger: chattering to each other, sometimes holding hands, the kids show off their rainbow of ethnicities at the same time they’re showing off their costumes. Over the ten-plus years I worked and hung out with the artist Edward Gorey, he never particularly relished Halloween. Kids, yes: they charmed him almost as much as cats and dogs did. To adults he could be courtly and courteous or sardonic or chilly, but to kids he was just plain sweet. He was also partial to bats and skeletons, more so to mysteries, less so to pumpkins; but not in the same up-close way. He thought it was bizarre that adults kept linking him to Halloween. He disliked anyone calling his work macabre. There was nothing prurient in his curiosity about death. In San Francisco, death, like almost everything, is practically an art form. Edward only visited this city once that I know of. He and his friend Connie, who attended Mills College, met on the top floor of the Fairmont (as I recall) one weekend when he was on leave from his Army job in Utah and danced the night away. (For more on that Army job, which I strongly suspect fostered many of his later interests, including The X-Files, see my book Edward Gorey on Stage…a Multimedia Memoir.) He had already put down his roots by then in the sandy, stony soil of Cape Cod. California interested him, as everything interested him, but he had no inclination to travel here (or anywhere). Still, every year when the kids go by, I think of Edward. He would have stood on the balcony, as I do, and watched this homespun parade in absorbed fascination. Then he would have chucked the cat under her chin — “Wuzzum wuzzum!” — and gone back to his drawing board. What’s So Addictive About Jane Austen & the Regency Era?